When half of a binary system goes supernova, usually that means a very bad day for the remaining star. But DEM L241 is tougher than that, surviving the astronomical blast to shine another day. The optical image is a mess of gas and dust (yellow and cyan) captured by Magellanic Cloud Emission Line Survey (MCELS) ground-based telescopes in Chile, layered with stars (white) from the Digitized Sky Survey. Recent images in the x-ray band taken by NASA's Chandra X-Ray Observatory reveal something new: a little pinprick of light in a haze of ionized gas (purple). This pinprick is the intact companion star of the binary system, now paired with the supernova remnants either a neutron star or a black hole. The gas contains the usual mix of neutral and ionized hydrogen, but is also enriched in oxygen, magnesium, and neon. The surviving star is much larger than our sun. That, along with the gas composition, suggest the star that went supernova was somewhere 25 to 40 times larger than our sun. They orbit with a period of approximately 10 days, although the velocity of the survivor star is changing. The South African Astronomical Observatory's 1.9-meter telescope is continuing to observe the system, tracking the velocity variations the companion star in an effort to determine if the supernova remnant is a neutron star or a black hole. The original supernova took place a few million years ago; the companion star should also die by a supernova sometime in the next few million years. When it does, it, too, will leave a remnant of either a neutron star or a black hole. 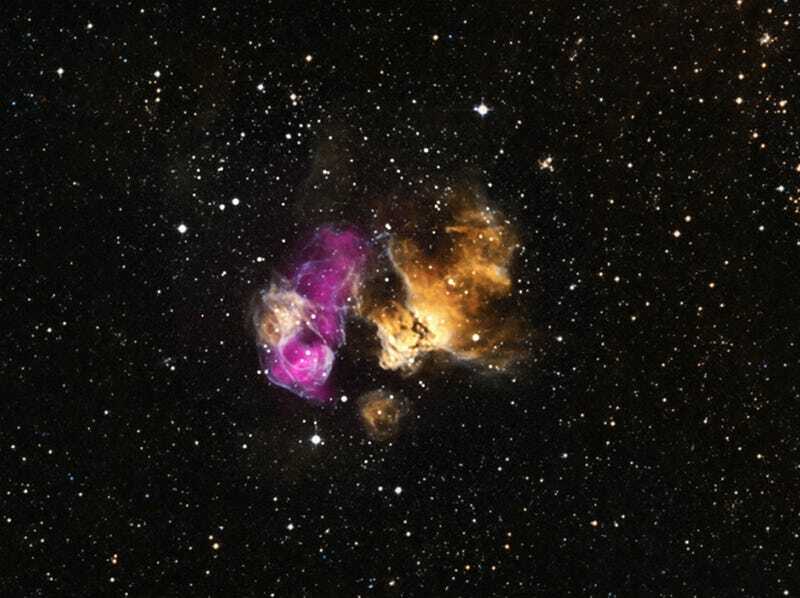 Read more at the Chandra press release, or the full article DEM L231, a Supernova Remnant containing a High-Mass X-ray Binary.